A new study suggests that rapid cooling within the Earth's mantle through plate tectonics played a major role in the development of the first life forms, which in turn led to the oxygenation of the Earth's atmosphere. The study was published in the March 2018 issue of Earth and Planetary Science Letters. Scientists at the University of Adelaide and Curtin University in Australia, and the University of California at Riverside, California, USA, gathered and analyzed data on igneous rocks from geological and geochemical data repositories in Australia, Canada, New Zealand, Sweden and the United States. They found that over the 4.5 billion years of the Earth's development, rocks rich in phosphorus accumulated in the Earth's crust. They then looked at the relationship of this accumulation with that of oxygen in the atmosphere. 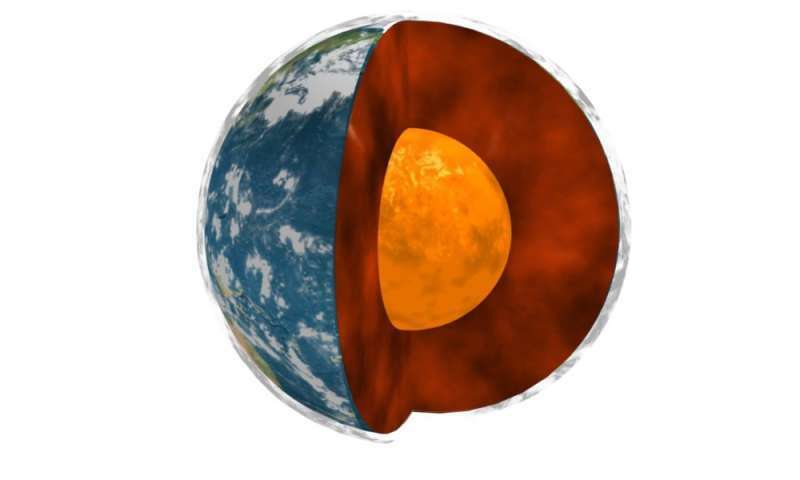 To find out how the level of phosphorus in the Earth's crust has increased over time, the scientists studied how rock formed as the Earth's mantle cooled. They performed modeling to find out how mantle-derived rocks changed composition as a consequence of the long-term cooling of the mantle. Their results suggest that during an early, hotter period in Earth's history – the Archaean period between four and 2.5 billion years ago – there was a larger amount of molten mantle. Phosphorus would have been too dilute in these rocks. However, over time, the Earth cooled sufficiently, aided by the onset of plate tectonics, in which the colder outer crust of the planet is subducted back into the hot mantle. With this cooling, partial mantle melts became smaller. As Dr. Grant Cox, an earth scientist at the University of Adelaide and a co-author of the study, explains, the result is that "phosphorus will be concentrated in small percentage melts, so as the mantle cools, the amount of melt you extract is smaller but that melt will have higher concentrations of phosphorus in it." The phosphorus was concentrated and crystallized into a mineral called apatite, which became part of the igneous rocks that were created from the cooled mantle. Eventually, these rocks reached the Earth's surface and formed a large proportion of the crust. When phosphorus minerals derived from the crust mixed with the water in lakes, rivers and oceans, apatite broke down into phosphates, which became available for development and nourishment of primitive life. The scientists estimated the mixing of elements from the Earth's crust with seawater over time. 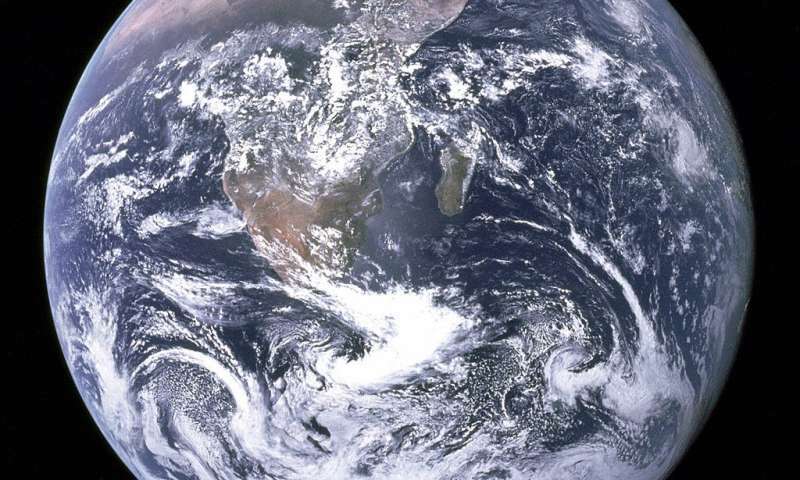 They found that higher levels of bio-essential elements parallel major increases in the oxygenation of the Earth's atmosphere: the Great Oxidation Event (GOE) 2.4 billion years ago, and the Neoproterozoic Oxygen Event, 800 million years ago, after which oxygen levels were presumed to be high enough to support multicellular life. All of these events support a scenario in which the cooling of the Earth's mantle led to the increase of phosphorus-rich rocks in the Earth's crust. These rocks then mixed with the oceans, where phosphorus-containing minerals broke down and leached into the water. Once phosphorus levels in seawater were high enough, primitive life forms thrived and their numbers increased, so they could generate enough oxygen that most of it reached the atmosphere. Oxygen reached levels sufficient to support multicellular life. Dr. Peter Cawood, a geologist at Monash University inMelbourne, Australia, comments to Astrobiology Magazinethat, "it's intriguing to think that the [oxygen] on which we depend for life owes its ultimate origin to secular decreases in mantle temperature, which are thought to have decreased from some 1,550 degrees Celsius some three billion years ago to around 1,350 degrees Celsius today." Could a similar scenario be playing out on a possible exo-Earth? With the Kepler discoveries of a growing number of possibly Earth-like planets, could any of these support life? Cawood suggests that the finding is potentially significant for the development of aerobic life (i.e. life that evolves in an oxygen-rich environment) on exoplanets. "This is provided that [phosphorus] within the igneous rocks on the surface of the planet is undergoing weathering to ensure its bio-availability," says Cawood. "Significantly, the phosphorus content of igneous rocks is highest in those rocks low in silica [rocks formed by rapid cooling] and rocks of this composition dominate the crusts of Venus and Mars and likely also on exoplanets." Cox concludes by saying that, "This relationship [between rising oxygen levels and mantle cooling] has implications for any terrestrial planet. All planets will cool, and those with efficient plate tectonic convection will cool more rapidly. We are left concluding that the speed of such cooling may affect the rate and pattern of biological evolution on any potentially habitable planet." "...."Significantly, the phosphorus content of igneous rocks is highest in those rocks low in silica [rocks formed by rapid cooling] and rocks of this composition dominate the crusts of Venus and Mars and likely also on exoplanets." That phrase seems poorly edited to me. However, if I understand what Dr. Cox & Dr. Cawood are saying. Here is another level of complexity to add to the odds against Living Worlds developing anything but the most primitive micro-organisms. Venus failed from a lack of tectonic activity to establish a biosphere. Cloaked in thick atmosphere, there was no way to radiate the heat from it's mantle in addition to the heat from proximity to the Sun. Mars failed for being too far from the Sun. And tectonic activity ending too early. With the additional handicap of low mass. Without the gravity to retain either the ancient Mars atmosphere or hydrosphere. Another reason to doubt the optimistic guesstimates for numerous Living Worlds.